Jean-Noel Kouame speaks with Reuters inside his house on the outer limits of Abidjan, Ivory Coast, Dec. 18, 2017. Standing by a towering equatorial forest, Jean-Noel Kouame’s new breeze-block house may be beyond the reach of Ivory Coast’s power grid, but it’s perfectly located for solar power entrepreneurs. Buoyed by success in East Africa, off-grid solar power startups are pouring into West Africa, offering pay-as-you-go kits in a race to claim tens of millions of customers who lack reliable access to electricity. At least 11 companies, including leading East African players such as Greenlight Planet, d.light, Off-Grid Electric (OGE), M-KOPE Solar, Fenix International and BBOXX, have moved into the region, most within the last two years. With a potential market worth billions of dollars, major European energy companies such as French utilities EDF and Engie are taking notice too. “It’s important to be there now, because the race has already started,” said Marianne Laigneau, senior executive vice president of EDF’s international division. The main challenge facing smaller companies now is how to raise enough capital to supply the expensive solar kits in return for small upfront payments from customers. A solar panel is pictured on the roof of Jean-Noel Kouame's house, on the outer edge of Abidjan, Ivory Coast, Dec. 18, 2017. Mobilizing funding for firms providing home solar systems is also part of the U.S. government’s Power Africa initiative. Major power generation projects have been slow to get off the ground so Power Africa has partnered with startups such as OGE, M-KOPE and d.light, among others, to accelerate off-grid access. In Abidjan, Kouame doesn’t know when, or if, the national grid will reach the outer edge of the urban sprawl, but thanks to his new solar panel kit he has indoor lighting, an electric fan and a television. But it’s the light bulb hanging outside his front door that he values the most. Some 1.2 billion people around the world have no access to a power grid, according to the International Energy Agency (IEA). Lighting and phone charging alone costs them about $27 billion a year and some estimates put their total annual energy costs at more than $60 billion. While governments in much of the developing world are extending access to national networks, Africa is lagging, with less than 40 percent of African households connected, IEA figures show. But what has long been decried as a major obstacle to Africa’s development is viewed as an opportunity by entrepreneurs such as Nir Marom, co-founder of Lumos Global, the Dutch startup that built and sold Kouame his kit. 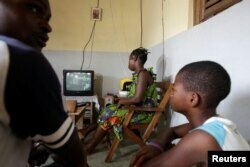 Jean-Noel Kouame joins his family as they watch television inside their house in Abidjan, Ivory Coast, Dec. 18, 2017. Lumos Global’s kits, which cost about $600, include a solar panel linked to a battery that supports power sockets, a mobile phone adapter and LED light bulbs. Kouame, who paid 30,000 CFA francs ($57) upfront for his kit, is now leasing-to-own. A digital counter on the yellow battery pack tells him when he needs to top up his account using his mobile phone. If he doesn’t pay, the kit, which also houses a global positioning system, shuts down. But in five years, he’ll own it outright and his solar power will be free. 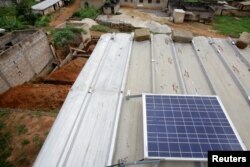 Pay-as-you-go solar home systems (SHS) like Kouame’s have been the main driver of off-grid power expansion in Africa. In 2010, when most purchases were limited to simple lighting systems, customers spent $30 to $80 on average over a product’s lifetime, according to GOGLA, an independent off-grid industry association. Now it’s $370 to $1,120. Global revenues from the pay-as-you-go SHS sector were $150 million to $200 million in 2016, GOGLA estimates. That should jump to $6 billion to $7 billion in 2022. Most of the main players in West Africa cut their teeth in East Africa, drawn by the widespread use of mobile money transfers, a key element of the pay-as-you-go off-grid model. Success there drove annual sector-wide growth of about 140 percent from 2013 to 2016. But as the East African market becomes more crowded and mobile money services spread across the continent, many are now heading west. “I remember doing a market sizing very early on and from a number of metrics West Africa was a better market,” said Xavier Helgesen, CEO of Tanzania-based Off-Grid Electric (OGE), one of the sector leaders. About half of the overall African off-grid population are in West and Central Africa, according to the IEA. Nigeria, sub-Saharan Africa's biggest economy and most populous nation, is alone home to roughly 90 million people with no grid access. Lumos is an outlier to the extent it picked West Africa as its first market. It launched in Nigeria in 2016 and by the end of 2017 had sold 73,000 kits and was averaging 16 percent month-on-month revenue growth. Late last year, it expanded into Ivory Coast, French-speaking West Africa's largest economy. Still, despite the rapid growth to date, off-grid solar startups say more must be done to improve the capacity of solar home systems and to bring down their cost so the sector can reach its full potential. 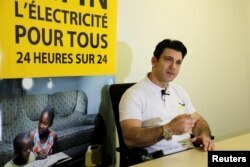 “I don’t believe off-grid electrification is a stop-gap,” said Jamie Evans, director of partnerships with d.light. “I believe it’s here to stay. If the price of batteries starts dropping precipitously, then it will almost certainly change the face of the industry,” he said. Stephane Abrahams, CEO of Lumos Ivory Coast, speaks during an interview with Reuters in Abidjan, Ivory Coast, Nov. 10, 2017. The need to provide consumer financing for the relatively expensive kits means expansion requires significant capital. But banks, lacking expertise in the new sector, often shy away from lending to off-grid companies, said Rolake Akinkugbe, head of energy at Nigeria's FBNQuest Merchant Bank. “There's also a size issue. Most of the off-grid solutions, particularly those that deal with pay-as-you-go, from a funding perspective, are not within the threshold for banks,” she said. That means startups have largely relied on venture capital, impact investors looking to generate social benefits as well as a profit, and development finance institutions. But the model has its drawbacks. “Right now off-grid companies are having to constantly fundraise,” said Lyndsay Handler, CEO of Uganda-based Fenix International. In what was considered a milestone in the African off-grid sector, Engie bought Fenix in October. With access to Engie’s capital, Handler says Fenix aims to become a pan-African off-grid leader, serving millions in the near term and tens of millions further down the road. “Hundreds of millions of dollars of investment are needed to have the impact we want to have,” she said. Facing stagnating customer growth in their home markets, European energy companies such as Engie are increasingly looking abroad. Africa’s underserved, growing population is seen by many as the future. The number of Africans without grid access actually increased by nearly 14 percent between 2000 and 2016 to 588 million people. By 2030, the IEA estimates that some 80 percent of the global off-grid population will be in sub-Saharan Africa. Raphael Tilot, Engie Africa’s head of customer solutions, likens off-grid solar to the rise of the mobile phone, which leap-frogged landline networks on the continent. In addition to Engie, French giants Total and EDF also hold stakes in off-grid startups, or are partnering with them. Italian utility Enel and Germany's E.ON are investing in solar mini-grid companies. Evidence of the market growth is on exhibit on Kouame’s hillside in Abidjan, where several rooftops, including his neighbor’s, are now crowned with solar panels.